One of the most important lessons from the 2011 East Japan Earthquake Disaster is that many people were killed by tsunami although there was some leading time of 30 minutes or more before the attack of tsunami, and the large tsunami warning was issued by the authorities. 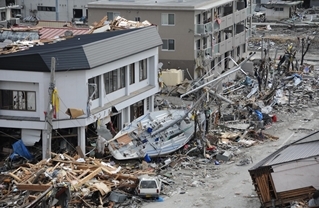 As this region was repeatedly stricken by tsunami in its history, most of people are aware that the tsunami will attack after a large earthquake. The reality is, however, that many people did not evacuate immediately even after they received the tsunami warning due to various reasons. Many people used their cars for evacuation and were eventually stuck in the traffic jam and killed by tsunami. Some people successfully reached the evacuation building but unfortunately killed by tsunami which was higher than the evacuation building. In order to reconstruct tsunami resilient communities, it is indispensable to improve not only the hard countermeasures such as seawalls but also the soft countermeasures such as the capability to evacuate immediately under any circumstances. This principle should be also applied to the other tsunami prone areas in Japan, particularly where Tokai/Tonankai/Nannkai Earthquake is anticipated soon. The objective of this research is therefore to discuss countermeasures for effectiveness evacuation such as disaster information and risk communication, evacuation to higher locations, development of evacuation buildings, and traffic plans for evacuation at multi-disciplinary way, to make policy proposals for effective and efficient evacuation system. This study is implemented for 2 years from 2012 to 2013. It is planned to offer the policy option for the following items.